Conflict is frequent and inevitable in healthcare. Why? We have different personal and professional values. Moral issues and values often play a role in medical care and decision-making, and the values of individual team members may at times conflict. We may have a different understanding of the same patient or situation. For example, one physician may see a patient as having a potentially treatable illness, while another sees him as someone who is suffering and should be allowed to die peacefully. There is often not a single “right” or evidence-based answer. The different experiences of team members may lead to different approaches to the same patient or issue. We come from diverse cultural backgrounds. Team members – including patients – all bring their personalities and cultures to the table, and icebergs can bump. Working in healthcare is stressful and can cause individual ‘resource depletion’. Fatigue, stress, and burnout all make conflict more likely. We may have inadequate institutional resources, leading to tussles to get our patients what they need – the next operating room, an expensive medication, etc. To build and maintain relationships with each other. Health care team members often work together for years. Medical school classmates will be a source of support for each other, and may find themselves in the same residency programs and ultimately practicing together. A competing style is higher in assertion and lower in cooperation. Someone using a competing style might approach the conflict by making as strong a case as they can for their own position. They may be very amiable and polite about it – competing does NOT mean harsh – but they have a viewpoint that they strongly assert. Perhaps someone using a competing style is very confident that hers is the correct position. She may be in a position of power and intend to pursue this course even if it is unpopular with others – a competitive style may avoid wasting time in meaningless discussion if the course is already set. A collaborating style is both assertive and cooperative. Someone using a collaborative style might approach a conflict as an opportunity to work together to build the best possible understanding or solution. He would express his own perspective, but would also elicit and listen to the perspectives of others. Perhaps someone using a collaborative style knows that each member of the group is likely to have different ideas and input, and that all might be contribute to the group’s understanding of a critical issue, or to solving a challenging problem. He may want to build strong relationships within the group, even though it might take a lot more time than a less cooperative style. A compromising style is medium in both assertiveness and cooperativeness. 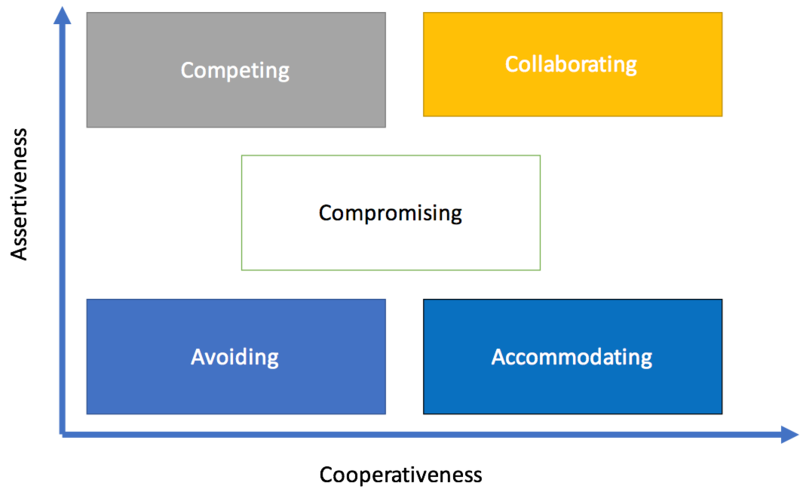 Someone using a compromising style might approach the conflict as an opportunity to meet in the middle, to give and take to find something all group members can live with. An avoiding style is low in both assertiveness and cooperativeness. Someone using an avoiding style does not share their own perspective or listen to others – they don’t want to engage with this conflict right now! Perhaps someone using an avoiding style needs time to process their own thoughts or cool down, and they plan to return to the topic later on. Or perhaps the issue is unimportant to them, or they don’t think they have the power to make change. An accommodating style is low on assertiveness, but high in cooperativeness. Someone who is using an accommodating style is putting the concerns or needs of others ahead of their own. Perhaps someone using an accommodating style knows that the issue is far more important to the other(s) than it is to them, or that the relationship is more important than the issue. This entry was posted in Interactions, Interprofessional Education (IPE) & Communication, Professionalism on August 19, 2017 by mspin.